Another hot one in Oxford. The high temperature was 90 but with high humidity the heat index was approaching 100. Summer is not over in Mississippi. Another few weeks will make a big difference, hopefully. Another team will be here after annual meeting and hopefully they will enjoy some cooler weather. Lots of thunderstorms in the area but we still have had no rain. Rich was cutting grass today and goodness at the dust. Thankfully he was wearing a mask. Max and Anne brought devotion today based on Philippians 2:14-16 NIV. Take a look at that passage again sometime soon. So many things we could have discussed, such as the “without grumbling or arguing” but we focused today on “then you will shine like stars in the sky as you hold firmly to the word of life.” Next time you find yourself enjoying a night sky full of stars, remind yourself that you are to shine like those stars on a clear night, not like a cloudy night. The team continued to work hard today. 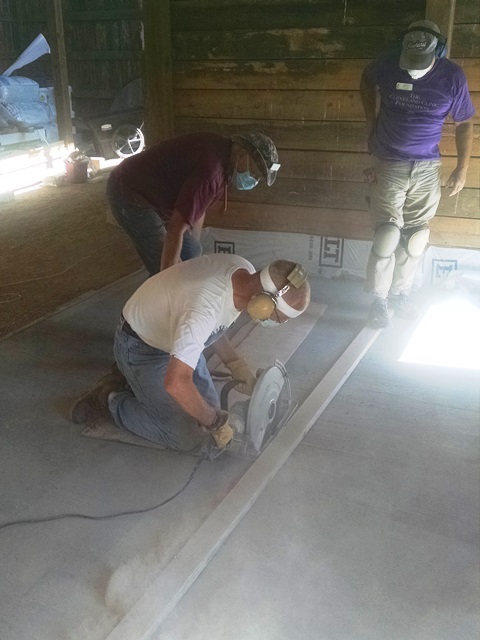 The barn crew, Shannon, Dave and John cut the expansion joints in yesterdays concrete, installed the Tyvek and then started framing the interior walls. 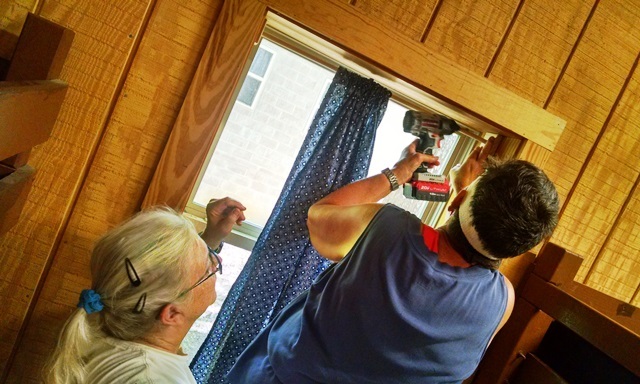 Carol and Mariel installed curtains in cabins that will be used this weekend for a family retreat. 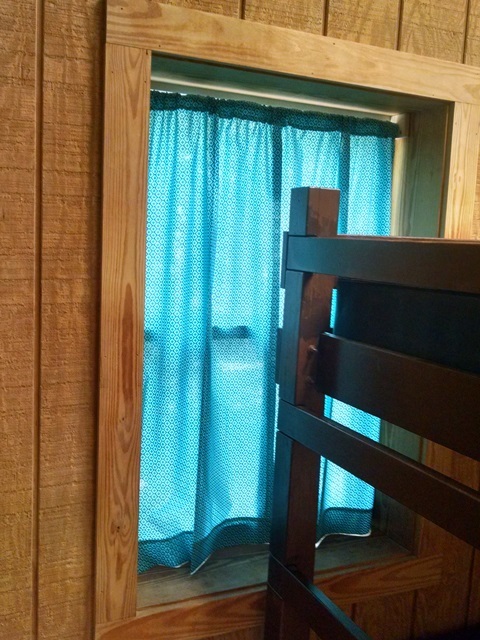 The curtains were made by some church ladies for the camp and really pep up the interior of the cabins. 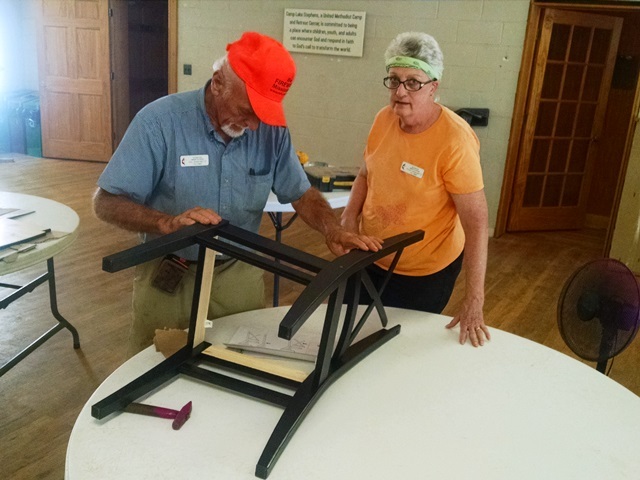 Peggy and Dale started putting together the Ikea furniture for the cabin where Max and Anne and Kitty have been working. 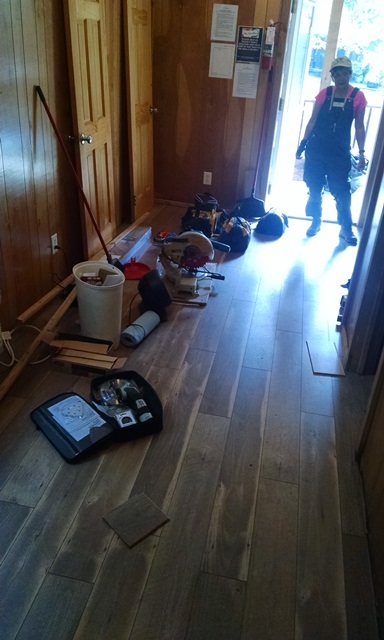 The cabin flooring is almost complete, just a little left in the bathroom. There is still some plumbing to do and some major cleaning to be done. 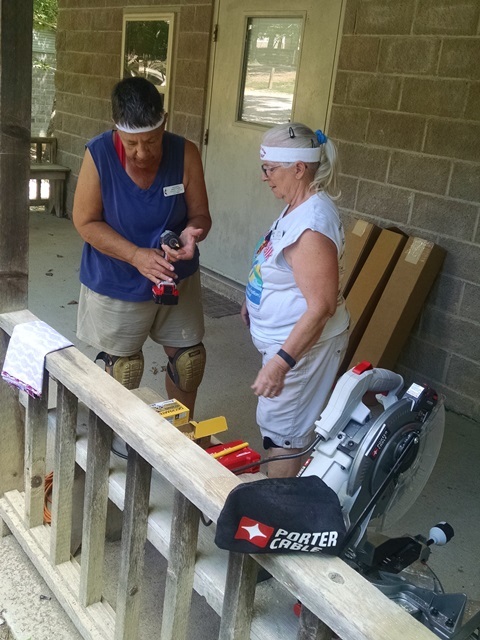 Max installed a gutter on the cabin today to prevent the water problems we have been working to repair. 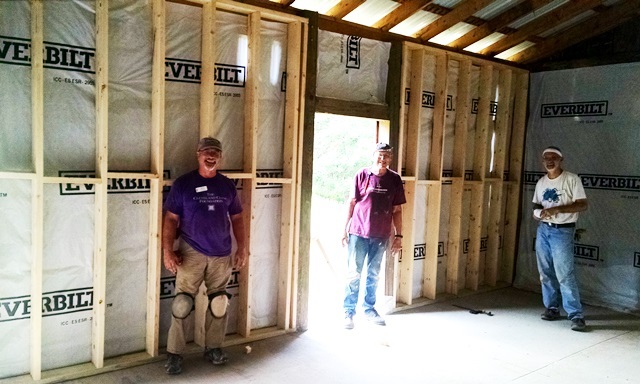 This cabin is being changed to a hermitage retreat type cabin for pastors. 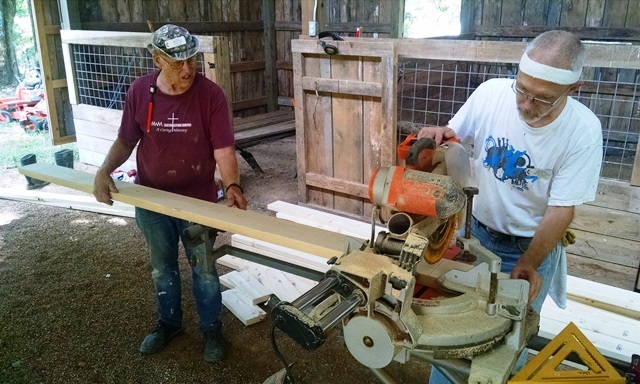 For summer camp the furniture will be removed and bunk beds reinstalled for the summer guests. Lots more progress was made and we are all again, really tired. Lots more to be done tomorrow since it’s our last day of work until next Tuesday. We will work next Friday to make up for taking off Labor Day. Okay, while typing it has started raining. Maybe we will get enough to take care of all the dust. Hopefully it will last until bedtime. Love to sleep to rain on Fred’s roof. Hope your week is going well.